We all know that women adore red roses. Shown here is a luscious bouquet of red roses placed in a wicker basket with a little ribbon around it. Her heart will just melt when she sees this beautiful display of affection. 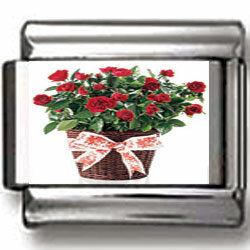 This charm has a clear coat of enamel that enhances the quality of the photo and protects it from dings and scratches.